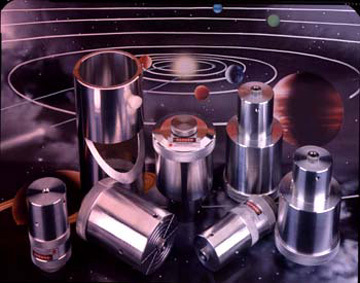 Above: Assortment of Glatter Laser Collimators and Accessory. Left to right: 1.25", 2", 2" SCT Adapter Tube with Cutaway, 1.25/2", 1.25", 1.25/2", 1.25/2" Models (67,101 bytes). Howie Glatter started a small, U.S. based company that is fast becoming known in the international astronomy community for having developed a number of original accessories. Innovations by Glatter include the SkyPointer hand held green laser pointing device, and the line of Laser Collimator devices used to indicate whether or not the optical components in most telescopes are properly aligned, one to anothe. The laser collimator is a tool which enables precise adjustment of the position and alignment of telescope optics, so as to obtain the best possible image contrast and resolution. Inside the body of the collimator is a solid-state laser diode, which emits an intense laser beam exactly along the central axis of the cylindrical collimator body. The beam acts as a "reference line" from which alignments are made.The lasers employed in the Glatter collimators are are class IIIa lasers with a maximum output of 5 thousandths of a Watt; these are quite safe if they are used with reasonable precautions however, direct or mirror-reflected eye exposure should be avoided! There is some ambivalence among some amateur astronomers regarding the use of portable laser collimators, because they believe it is good for the novice to learn how to adjust the mirrors by just looking through the eyepiece holder. This practice develops familiarity with the optical system. These amateur astronomers share an opinion that providing a laser collimator to a novice is like giving pocket calculators to kids who should be studying multiplication tables. Howie Glatter realized that collimating with a laser can provide as much insight into optical alignment as collimating by eye through the eyepiece holder; "when applied correctly, the darned thing was so accurate and quick that I couldn't resist it. The fact that collimation could be done in the dark with ease also seemed like a great advantage. Since I was making them myself, I felt I could produce a very high quality collimator at a reasonable price, and put more of them into people's hands (I love machining stuff anyhow). It seems to be working out well, and I feel blessed that I can earn a living from something I believe in." Holographic The Glatter holographic collimator has in addition to the laser, a removable transparent diffractive optic (the "hologram") that is placed in the path of the beam, just ahead of the laser. It diffracts light from the laser to project a diverging, symmetrical pattern around the beam, which is quite useful for centering optical elements and other procedures. The grid covers a wider angular range (21 degrees) than any other holographic collimator which allows direct centering of f/ 2.7 to f/ 35 optics. A rectilinear grid pattern gives the highest accuracy and sensitivity for centering circular optics of arbitrary size. 532, 635, or 650nm Wavelength? The larger the holographic pattern is, the more the laser's light is spread out, and so the pattern becomes less bright. Glatter offers the red holographic collimators with a choice of either 650 nanometer or 635nm wavelength. The 635nm. lasers appear about two or three times brighter than the 650nm, but these are more costly. The two lasers actually have the same radiometric power output, but the human eye's sensitivity to the shorter wavelength is greater. The difference would be in the level of ambient light that collimation can be done in. The ultimate in pattern brightness is available with the Glatter 532nm green holographic laser collimator. It utilizes a 5mw, 532nm laser that produces a high intensity green beam. This beam appears much brighter than the red ones in part because the human eye is most sensitive to light in this area of the spectrum. The 532nm beam makes collimation easy even in full daylight. The green collimator can also be used as a pointer for pointing out celestial objects to groups of people. All green class IIIa pointers sold are designed for momentary use service; this means that they cannot be kept on continuously, and should be on for periods of no longer than one minute. After being on this long, the pointer must be allowed to recover thermally for a similar period. If the pointer is kept on longer or continuously, then it may dim out however, it will not be damaged because the control circuit will automatically reduce the current. Laser Accuracy and Stability The most important specifications for a laser collimator are the accuracy and stability of the laser beam alignment to the cylindrical axis of the collimator body. Glatter's alignment tolerance is fifteen arc seconds for single beam mode, and one arc minute for the holographic mode. In order to ensure maintenance of this level of accuracy each of these collimators are engineered and then tested for resistance to shock. Compatability The collimator is used to indicate whether or not the optical components in most refractive or reflective telescopes are properly aligned, one to another. There are some catadioptric telescopes (most notably the typical consumer Schmidt-Cassegrain) where obtaining an accurate alignment may be can be impossible because manufacturers have not provided a mechnicsm to adjust the angular alignment of the secondary mirror. If any of the other optical elements are out of center or alignment, then the secondary can only be adjusted to minimize the aberrations induced by the other misalignments. On the other hand, If you happen to be one of the lucky ones who's SCT has perfect or near perfect alignment in the other elements, collimating the secondary will produce superb images. Howie Glatter has developed a new procedure, using the holographic laser collimator to produce the optimum secondary adjustment. The new collimation procedure has special utility for telescopes where some of the optical elements are not user adjustable, like Meade and Celestron SCTs. With these telescopes, the best one can do is to find the optimal position of the secondary. Glatter has produced good, detailed instructions on how to employ the Laser Collimator with each type of telescope. These instructions are included with each device we sell. Additional Uses Star diagonals can be aligned and centered by first collimating a telescope without the diagonal, then inserting the diagonal in the optical path and adjusting the mirror or prism so that the telescope's alignment is restored. Another application is checking the collimation of binocular viewers.The two eyepiece tubes should show the same telescope collimation when the collimator is successively inserted in them. The collimation can also be checked with the binocular attachment alone, by setting the attachment rigidly on a table or stand, and viewing the beam impacts on a screen at some distance (any built-in Barlow must be removed for this). The beam impacts should coincide. The 2"/1-1/4" collimator will insure accurate alignment in a 1.25" or 2" eyepiece holder. But the 1-1/4" collimator models will work well in a 2" holder only if used with an accurate adapter bushing such as the Astro-Physics Model ADA125. The adapter too can be checked for accuracy with the collimator, by rotating the adapter and reclamping it; the laser spot should not wander.